We will pick you up morning from your cruise ship in Aqaba port then transfer privately for one and half hour with AC van to wander Petra rose red city, it is one of the must see attractions in Middle East. Start with horseback ride along the Siq Canyon, it is a narrow gorge extends for about one kilometer and leads to the great Treasury. Proceed to wander the Street of Facades, explore the Royal Tombs & Qasr Al Bent. Drive to Wadi Rum protected area, one of the best desert landscapes in world. It becomes widely known in the west after Lawrence of Arabia has described it as "vast, echoing & god-like". 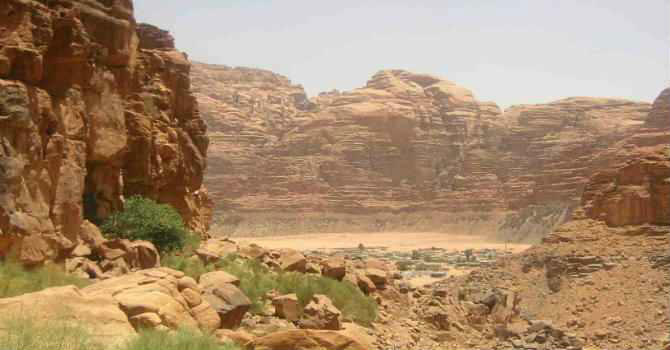 You will relish jeep adventure deep into Jordan desert among the rugged mountains and colored sand dunes to admire Jordan canyons, sand dunes, inscriptions and the natural rock bridge then transfer back to Aqaba port.